Much of the weight gained during pregnancy is not fat but rather goes to your baby and disappears from your body at birth. As a general rule, a profound drop in the hormones estrogen and progesterone can effect your emotions more than the number on the scale. The hormone oxytocin may actually accelerate, rather than prevent post-pregnancy weight loss in some cases. Most women lose more than 10 pounds during childbirth, including the weight of the baby, placenta and amniotic fluid. For example, an average-sized baby weighs about 8 pounds, the placenta 2 to 3 pounds and amniotic fluid 2 to 3 pounds, explains the MedlinePlus website, published by the National Institutes of Health. You'll lose even more weight in the first week after delivery as your body discards remaining retained fluid. Fat stored during pregnancy -- typically 5 to 9 pounds -- won't go away without your help. Breastfeeding your baby may help speed up weight loss. The hormone oxytocin, released during breastfeeding, acts to return the uterus to its regular size more quickly and can reduce postpartum bleeding, notes HealthyChildren.org, the official website of the American Academy of Pediatrics. Uterus growth during pregnancy can account for up to 5 pounds of pregnancy weight gain. The potential weight loss effects of breastfeeding are typically seen three to six months after delivery, when milk production peaks. Losing weight after pregnancy requires a nutritious diet and regular exercise. 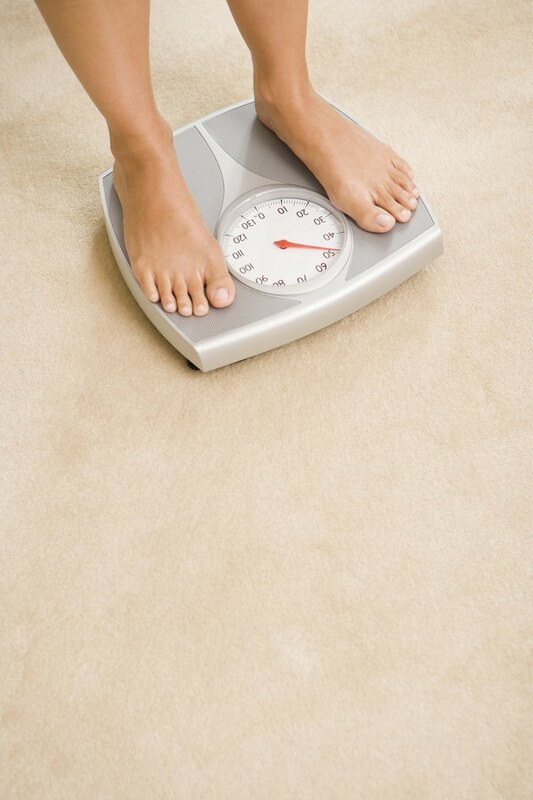 Losing about 1 pound per week is safe and realistic. Fruits, veggies and whole grains are rich in fiber and make you feel fuller longer. Reducing your portion sizes or eating smaller meals throughout the day instead of three larger meals can also help you shed excess weight. One hour of exercise per day -- starting with low-impact aerobic activity, like walking or swimming -- can speed up the weight-loss process once your doctor gives the green light. Abdominal exercises like crunches can help strengthen tone your abdominal muscles. It can take as long as six to nine months to return to your pre-pregnancy weight. Some new mothers who follow a nutritious diet and exercise regularly may still hang onto a few extra pounds and become more full-figured than before they became pregnant, points out the Ask Dr. Sears website. Others will eventually manage to fit into their "skinny jeans" like nothing ever happened.